Are you a gardener? 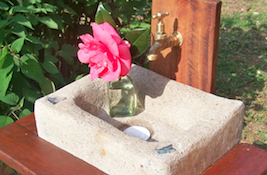 Need a place to wash hands and vegies? Want a feature piece in the garden? Adrienne and Paul have designed an original outdoor tub. Made from recycled timber and materials and a hand crafted concrete bowl, the Tuchekoi Garden Tubs make a unique feature piece for your garden or home. The Tuchekoi Garden Tubs are useful and attractive, being easily installed using standard garden hose fittings. Our Tubs are individually hand crafted pieces built from local recycled materials. Solid brass tap fittings complement the hand formed bowl. The solid hardwood frame is clad in recycled hardwood, corugated iron or painted timber. The hand formed bowls are made with a distinctive hypertufa blend and some with distinctive inlays. The brass tap can connect straight to the garden hose, or can be plumbed into the mains water. The waste water outlet is fitted with a 40mm standard plumbing outlet and 2m of flexihose which can be fed directly back into the garden. Alternatively the system can be plumbed into existing grey water systems. Our Leadlight Posts are individually hand-crafted rustic posts with a leadlight insert of your design. Priced according to size and complexity of design.